If you search for “Spell Eternity,” Google will give you the spelling for Eternity. If you make it to the Mojo Theater before May 6, you will be tested in the consequences of eternity. Quantum Dragon Theater’s “Spell Eternity” is your one stop shop for a fun night of fantasy theater backed with a spine of strong acting and elucidating interesting themes. As the action spilled from the minimalist set and fight scenes erupted at my feet, it occurred to me how successful fantasy can be in intimate theaters like Mojo. There was no great distance keeping me from the longing and fighting curiosity of Gerda, played by Marisa Darabi, or the god smacking ego of Max Seijas’ character Kai. In the fantastical world of this play, Gerda is a non-magical friend of spell caster Kai. When Kai disappears as the result of a curse, she is left to save their world without benefit of magic while seeking to find Kai before the curse destroys his mind. Thus, the story cleverly embraces both fantasy and technology. It makes for good entertainment. Though the first half felt a little long, the constant scene changes kept a solid pace and my attention. There is certainly a lot of material covered by writer/creater Alandra Hileman. The inclusion of an imaginary lexicon of places and terms in this created illusion of hers was effective, and did not weigh down or confuse the production. The creativity and constant movement of various boxes helped us to envision new and changing environments on our journey. The scenic design of Rachel Kerns is well thought out. Everything fits and helps the production to succeed. The plot is full of twists and turns. As surprises are endlessly allowed in fantasy the road our characters travel does not go beyond our desire or ability to imagine it, if we are willing. A light hearted pitch thrown every so often in the guise of high schoolish sarcasm and humor kept the performance from coming off as stern, or merely chasing it’s many tales. “Spell Eternity” is, in a sense, a choose your own production. One may very well show up looking for action, and in that regard the fight scenes are sufficient. If you wanted to leave your nine to five job behind and delve into this other world, then the language and costumes will take you there. If it is a live action hero’s journey that you need to inspire introspection and personal growth, just take Gerda’s hand. Alandra Hileman has built a quest, dressed it well, and dug and delved it deep. What you seek to find is ultimately up to you. “Spell Eternity” plays at the Mojo Theater through May 6th. For further information, click here. 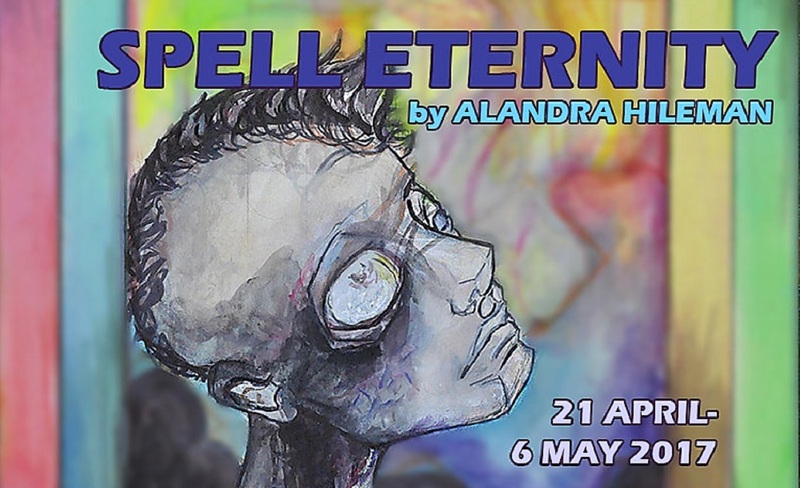 “Spell Eternity,” produced by Quantum Dragon Theater, created and written by Alandra Hileman. Director: Sam Tillis. Original Music: Derek Sup. Lighting: Cassie Barnes. Costumes: Thomas Ignatius. Scenic Design: Rachel Kerns. Sound Design: Alejandro Romero. Fight Direction: Sydney Schwindt. Stage Manager: Kelly Lahane. Technical Director: Karl Haller. Production Assistants: Jacinta Sutphin and Carnida Doran. Costume Assistant: Hannah Elizabeth. Gerda: Marisa Darabi. Kai: Max Seijas. Marzanna: Genevieve Perdue. Glyndwr/Tarnfalk/Ensemble: Karl Schackne. Krage/Hermit/Ensemble: Michael James Hawkins. Hanegal/Bent/Ensemble: Matt Gunnison. Torva/Bo/Ensemble: Lisa Darter. Liv/Ing/Ensemble: Kitty Tores. Posted in Reviews.Tagged Alandra Hileman, Charles Kruger, Quantum Dragon Theatre, Sam Tillis, san francisco bay area theatre reviews, Sean Taylor, Spell Eternity, theatrestorm.